Tuesday’s recovery from Monday was slight, and today markets gave up that slight recovery, although there was not much volatility. SPX and DJIA ended only 0.2% down, and NDX 0.3% down. DAX, FTSE and NKY were also in the red. 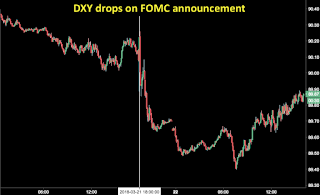 The FOMC duly delivered their widely expected 25bp rate increase, which caused an sharp 0.75% drop in DXY. 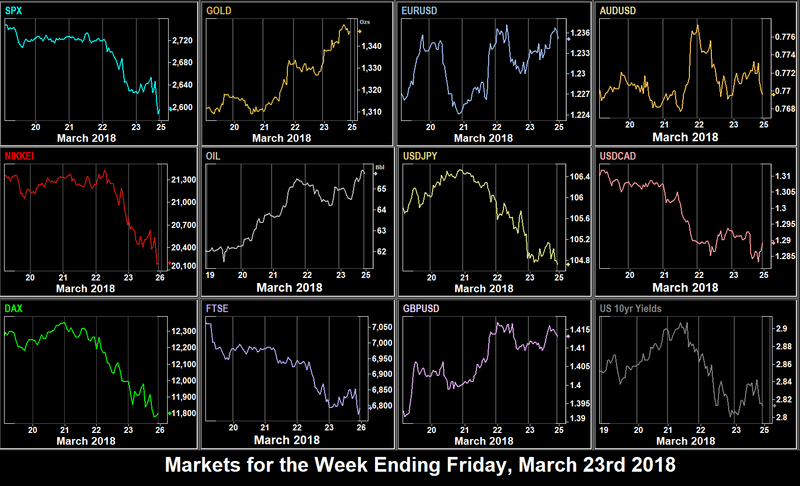 All currencies (and Gold) were up. In particular CAD was up 1.29% on NAFTA hopes and another big rise in Oil, which in turn was up 2.81% (and 5.31% so far for the week) on fears of new Iranian sanctions, and following the 1430 EIA stock beat. Also GBP was up 1.02% after the 0930 unemployment/average earnings beat, and progress in the Brexit transition agreement. Gold was up significantly, posting its best day since May 2017, up rising 1.7% to $1,333. US bond yields did not join the party, suggesting the moves were more driven by the other currencies than USD itself. They were flat on the day. Stocks fells heavily all day today as the US stepped up the trade war by announcing further tariffs on Chinese imports. SPX erased all March’s gains with its worst day since the extreme moves at the beginning of February, falling 2.5%, with the DJIA giving up over 400 points in the last two hours alone. 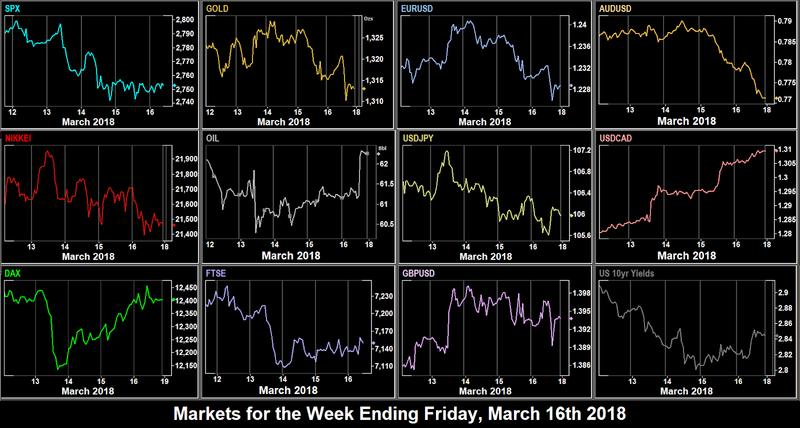 Other indices fell in line around the world, DAX was down 1.7% and FTSE 1.2% at the cash close and continued to decline in the futures session. USD was still digesting the FOMC rate hike, which was essentially hawkish (one extra hike in 2019). However, performance was mixed. USD did advance against most currencies, but the risk-off in equities saw JPY, Gold and bonds (inverse to yields) up in line. 10-year yields dropped 4bp. The 7-2 BoE rate decision (9-0 expected, ie two members voted for a hike) gave GBP a brief 60 pip rally to touch a seven-week high on 1.4217, but it quickly faded. Oil was up again, although it posted an inside day. The equity rout continued on Friday, after Trump announced yet another replacement, this time NatSec Advisors HR McMaster is out of the door, and more importantly China retaliated with new tariffs against US imports. After falling in Asia, markets recovered slightly during the European session, only to fall again sharply later. There was plenty of volatility, for example DJIA had recovered 400 points from the Asian only to give up 600 points in the last two hours. SPX and DJIA posted the lowest weekly closes since November, the former down nearly 6% on the week, and VIX hit a six-week high. DAX, FTSE and NKY fell in line. In currencies, there was a flight to risk-off safety, with JPY, Gold and CHF sharply up. 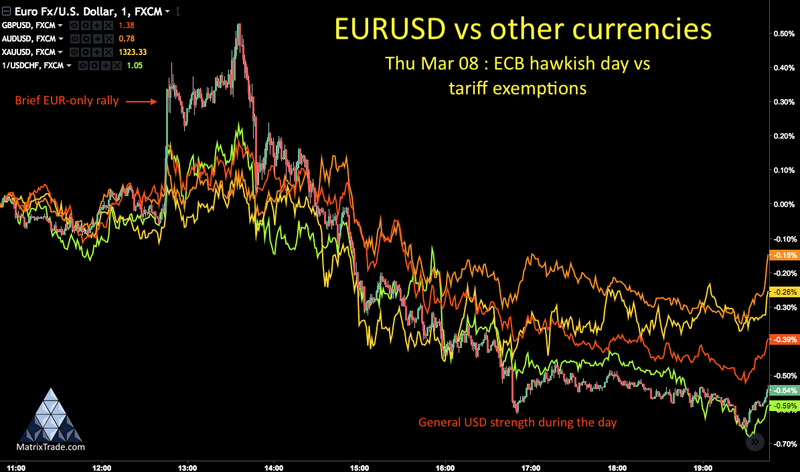 EUR and GBP were also up resulting in DX/y giving up 0.5% on the day. The Canadian CPI beat at 1330 added an immediate 86 pips (0.67%) to the loonie, and although some of this faded, it also ended the day up. AUD had rallied early, but gave up all those gains to end the day flat. Oil continued its advance despite the higher rig count to put on another 2.5% and close at a seven-week high of $65.90. Yields continued to fall, giving up another 2bp on the day. Last week’s best forex trade was to buy CADJPY, this week’s was to sell it for a 2.73% move. For the second week, shorting SPX was the best index trade. Volatility returned to Oil, but it still moved less than SPX which is unusual. The week starts off very quietly with no news of consequence. Two Fed speakers today, Dudley (voter, neutral) at 1730 and Mester (voter, hawkish) at 2130. Another quiet day with only the Eurozone confidence indicators to watch. Today’s speakers are Fed Quarles (0010) and Bostic (1600). Both are FOMC voters but neutral. Hungary, Brazil and Argentina make rate decisions, holds are expected. The most important economic release of the day and of the week is the US GDP followed by the Personal Consumption Expenditure (inflation proxy). Also in the US, Fed Bostic speaks again at 1700. PBOC Deputy Gov Pan speaks in China at 0200. South Africa makes a rate decision, a cut is expected. The last trading day of the week, month and quarter should see some portfolio rebalancing and therefore volatility across all asset classes. Important releases include German inflation and the YoY and MoM parts of PCE, although their effect is muted by the QoQ figure being released the day before. Note the German national inflation figure is preceded during the European morning by figures for the German regions, so the final figure is less of a surprise. Markets are closed in India. The Good Friday holiday into Easter means US, European and Australasian markets are closed. China, Japan and therefore forex trading are still open, but importantly CME Globex observes the holiday, so US index futures will be closed. The Italian Election result was as feared, a strong showing for both anti-establishment mavericks M5S, and more ominously, the anti-EU Lega who got a larger share of the vote than FI. DAX and the Italian MIB indices both opened much lower and then moved down, with DAX breaking the psychological 12000. However, the fear was short-lived and the upward trend was resumed. 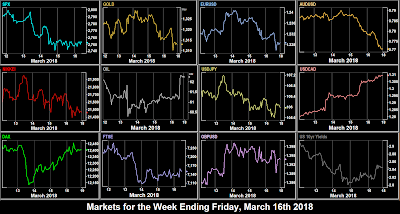 MIB ended a mere 0.42% down on the day and the US and other European indices were up as worries about a trade war dissipated, and the US PMI prints came in as beats. Our chart above seems to suggest a turnaround day on indices. That is because the line separators are drawn at midnight 0000 (see below). 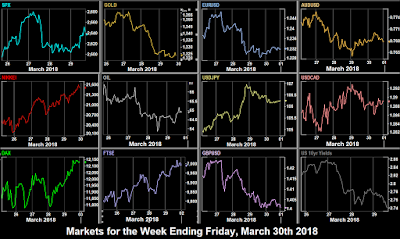 In fact by the US closing bell, equities were all slightly up on news at 1100 on talks of a detente meeting between Trump and Kim Jong-Un in April. Indeed, having previously faded after the RBA rate hold at 0330, AUD rose by nearly 1% in two hours on this news and NZD followed it. (KRW rose by 1.3%). The interesting thing is that Japan is also affected by NK stability, but its role as a risk-off haven won out, and JPY gave up 0.47%. Around the same time, TreasSec Mnuchin said that Canada and Mexico would be exempt from the new steel tariff if NAFTA talks were successful. CAD promptly gained 1% in two hours and rose further after the Ivey PMI beat at 1500. (MXN gained 0.66%). EUR and GBP both liked the first break in the tariff rhetoric, and also shot up. 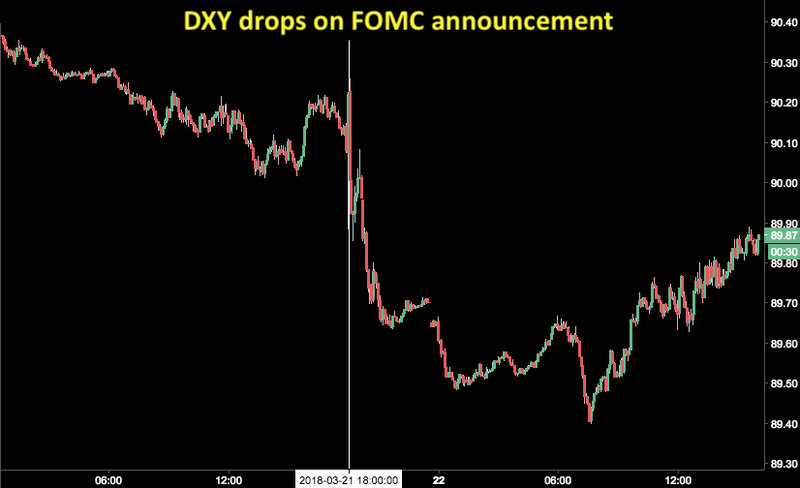 All this resulted in a sharp fall in DXY (down 0.59%) on the day. Surprisingly, with what seemed like good news Gold and yen did see a Turnaround Tuesdays, and were both up on the day. Oil was down (the API print missed at 2130), and after a lot of choppiness, yields closed flat. During the short closed period (2200-2300 Tue) before the Asian open, Trump’s economic advisor and GS alumnus Gary Cohn announced his resignation (over the tariff issue) which had a momentous effect. The Globex ES_F (SPX) future dropped 42 handles (1.55%), NKY cash opened 0.73% lower and DAX futures opened 1.55% lower at 0700. However, the effect was once again shortlived and SPX and FTSE recovered to end flat on the day. DAX ended up after the EUR ramp was stalled. Only NKY ended up red, partly due to the cash period timing, and also due to a Cohn-led ramp in JPY. In currencies, once again there was a mixed picture. The Cohn announcement caused a sharp fade in AUD and CAD, and a sharp ramp in JPY. However recovery started almost immediately and AUD and JPY ended roughly flat. CAD of course had another story, the 1.25% rate hold at 1500. This produced a two-hour 90 pip (0.7%) fade in the loonie, which was immediately recovered around 1945, when Mnuchin firmed up the tariff exemption. EUR and GBP were hardly affected, and after a small rise in EUR, and small dip in GBP, both ended flat, and therefore, despite all the intraday volatility, so did DXY (up less than 0.1%). Gold went its own way and gave up most of the previous day’s gain, to end $9 down at $1,325. Yields were slightly up a volatile day. We mentioned last week that (in the absence of major OPEC surprises and huge volatility) Oil has started to respond again to the EIA Stock print (at 1030 Eastern every Wednesday). And so it did this week, dropping 3% in two hours after the release. However the result was a small beat (+2.408M vs +2.723M), but clearly not the beat traders were looking for. The equity uptrend continued as Trump formally adopted the new steel and aluminum tariffs but gave an immediate temporary exemption to Canada and Mexico, and opened the door for other countries to apply to exemptions. All indices rose steadily all day to finish at their intraday high. BoJ Governor Kuroda’s first rate decision meeting since his reconfirmation was watched with more interest than normal, as he had made hawkish remarks setting a timetable for an end to stimulus at the confirmation hearing. In the event, this tone was not repeated at the press conference, and JPY, which had already been falling throughout the Asian session continued downwards, with USDJPY touching a two-week high of 106.95. The of course had a negative effect on NKY which at the intra-session low was 460 (2.1%) down. More good news came out after North Korea offered to suspend missile tests pending the meeting in April. However, the main news of the day was NFP, which came in as a standout 313k new jobs, only marred by a miss of average hourly earnings. This was a dream scenario for equities in the “good news=bad news, or does it” scenario. The AHE miss is a damper on rate rises, whereas equities love the new jobs. Equities also love a weak dollar (as we know only too well these last 12 months). Consequently US indices soared, with SPX adding 1.9% from the 1330 to the closing bell, finishing at the highest point since the early February sudden correction, and posting a marubozu (no wicks) candle for the week. Although other indices don’t benefit from the weak dollar, they followed suit. Notably DJIA is 1.5% away from that point, held down of course by steel/aluminum consumer heavyweights BA, CAT and KO. NDX did even better, breaking through 7000 to completely reverse the correction and make a new all-time high. A notable mover on Friday was GS, which dipped 1.3% briefly on the announcement that CEO Lloyd Blankfein is to retire, although it fully recovered later in the session. The dollar, as mentioned above, was down across the board, with GBP performing particularly well, rising back above 1.39. The confirmed tariff exemption for Canada added 87 pips (0.68%) which completely overshadowed the Canadian NFP miss. AUD was also up sharply, with only EUR and Gold failing to perform and putting in a flat day. Bond yields climbed briefly above 2.9% again, the highest figure since Jay Powell took over at the Fed, and ended the day up 1bp. Oil also bounced strongly from the $60 roundpoint, adding $2 (3.3%) on the day, no doubt partly influenced by the first rig count since Jan 19th. Reduced USD volatility this week, with AUD, GBP, NZD and JPY all posting inside weeks. Due to all the rate decision, the picture was very mixed with one trade clearly standing out. Buying AUDJPY would have netted 2.87%. Buying any index (except NIFTY) would have been good, the best being, unsurprisingly SPX at 3.36%. Incidentally that was the weakest US index, DJIA put on 3.58% and the NDX and RUT indices rose over 4%. Gold had a second flat week, and Oil was uncharacteristically quiet, although the small total move belies a range of 5.15% in the week. Cryptocurrencies fell hard again following more negative comments from regulators, although the 16% drop in Bitcoin no longer surprises. Our prices are given as at 0000GMT Saturday, two hours after the other markets close. Next week is a quieter week than the last few. Note that European traders enter the period we get twice a year where the US and Canada enter Daylight Savings Time two weeks earlier than Europe (and three weeks earlier than Australia and New Zealand leave it), and so all the US releases are an hour earlier for Europeans, and European markets open and close an hour later for US traders. The Fed is in blackout period prior to the rate decision on March 21st, so there are no Fed speakers this week. A quiet day with no important economic releases. There is a House election in Pennsylvania which is currently polled as too close to call, despite Trump winning the district by 20% in the presidential race. In Germany Angela Merkel will formally seal her SPD coalition pact prior to her fourth inauguration on Wednesday. We will have the result of the PA-18 election, and also the most important economic print of the week, the US CPI figure is released at 1230 (not 1330!). According to CME Fedwatch, a rate hike to 1.75% is 89% priced in. A miss here could substantially change that expectation, and move USD and bond yields sharply down. On the central bank calendar we have RBA Bullock at 0010 and Kent at 2210, BoC Poloz remarks released at 1415 (speech at 1430), and the BoJ MPC minutes at 2350. This last one is probably the most interesting, to see if the bank repeat Kuroda’s confirmation hearing remarks about ending stimulus in 2019. In the UK, the Spring Budget Statement (sometimes called the mini-Budget) is released in Parliament, although nothing much is expected. Several ECB speakers today: Coeure at 0730, President Death at 0800, Praet at 0845, Constancio at 1045, Villeroy at 1330 and Coeure again at 1615. All this follows the German inflation figure and so promises to be a volatile day for EUR. US Retail Sales are less important than usual, firstly because the release is MoM only, and secondly because the release is primarily viewed as a proxy for inflation, which of course has been reported the day before. Note that China Retail Sales are likely to be inflated by the New Year factor. Swedish CPI is released at 0830 (SEK is 4.2% of DXY). Another quiet day, although the SNB Rate Decision is at 0830, a -0.75% hold is expected. In Europe we get the EU27 ambassadors approved text for the post-Brexit relationship and ECB Lautenschlaeger speaks at 1545, Swedish unemployment at 0830, and the NOK rate decision at 0900. RBA Debelle speaks at 2245. Hungarian markets are closed for National Holiday. Eurozone inflation is reported at 1000, but this is rarely a market mover, as the likelihood of surprise across an average of 27 countries (who have all already reported) is very low. Of more interest is US Options Expiry, which, together with positions for the Fed next week should produce some volatility in the US session. 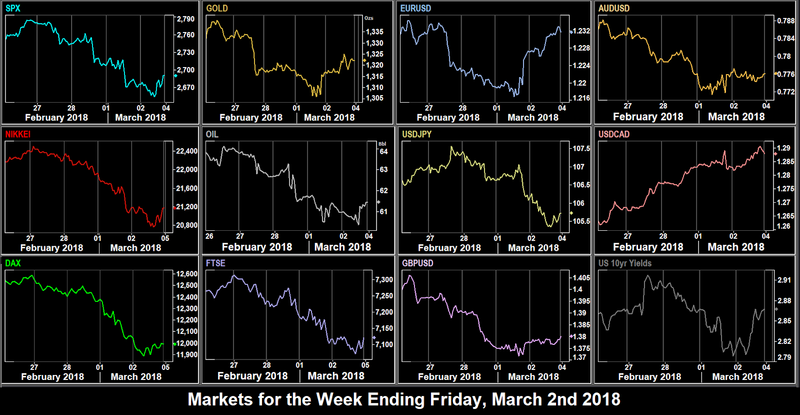 The upbeat mood in equities that finished last week continued on Monday, and all major indices were up with SPX up 1.2% on they day, and nearly 10% from the low on February 9 and only 3.3% away from the previous all-time high. 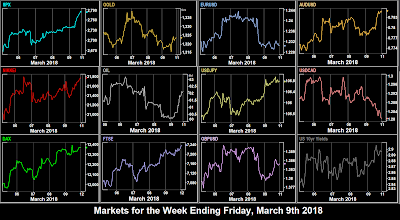 DXY was flat on the day, with a slight gain (0.1%) by EUR as ECB President Draghi’s remarks at 1400 reversed an earlier slide matched by slight dollar gains against the other major currencies (including ZAR, which appears to have topped for now). Gold did not follow USD, and was up a shade. Oil was similarly slightly (0.7$%) up, and US 10-year bond yields also had a quiet day, down 1bp. All in all, consistent direction but only small moves. Tuesday was new Fed Chair Powell’s first major outing, at the semi-annual Humphrey-Hawkins testimony, and some observers will say he is jinxed. You will remember that the market endured its biggest pullback in over two years on the day he took up office, and now on his first public outing, markets turned down again to start a week of decline, not helped by the German CPI miss at 1300, Trade Balance and Durable Goods misses at 1330, and the forward-looking House Price Index miss at 1400. All equity markets saw a Turnaround Tuesday and gave up Monday’s gains and then some. Powell largely stuck to agenda of his predecessor, but the market viewed it as slightly hawkish and bond prices (inverse to yields) and Gold were sharply down (to a two-week low) after his remarks. This consistency of Gold moving with rather than against indices shows that the interest rate roadmap (and therefore US dollar value) is the key driver to the price, rather than its traditional safe haven function. USD was of course up, with DXY posting a 0.62% gain, and advanced against all currencies. Oil was done in line with US strength, even before the API Miss at 2130. The pattern from the previous day largely continued on Wednesday as Powell gave further testimony to the Senate. Indices carried on fading, after misses on China PMIs (0100) Eurozone CPI (1000) and US GDP Price Index (1330) and the dollar rose again. The German unemployment beat at 0855 was ignored. Today of course there was also the effect of month-end rebalancing. SPX was actually up two hours before the US closing bell, and then faded 42 handles (1.53%) into the close. DJIA lost 411 points in the same period. Other indices followed suit after early gains. The decline was exacerbated by a sell-off in energy stocks, following Oil’s 1.3% pullback after the EIA Stock miss at 1530. As we have said previously, Oil has started to react again to this important news print, and we also saw a spike down in CAD. It is good to see islands of classic intermarket activity in this sea of sentiment. USD was up across the board, although Gold was flat on the day. GBP fell particularly hard after a poor reaction to the EU’s draft Brexit treaty, and a warning from EU negotiator Barnier that a transition deal was far from certain. Gold was flat on the day after the hard fall in the previous session. Yields did not follow USD, and pulled back 4bp on the day. The new month opened on Thursday with President Trump’s announcement a tariff on imported steel (25%) and aluminum (10%). Producer stocks in those industries soared. However these stocks are absent from DJIA and have low weights in SPX, but stocks of consumers in these metals are heavily represented. 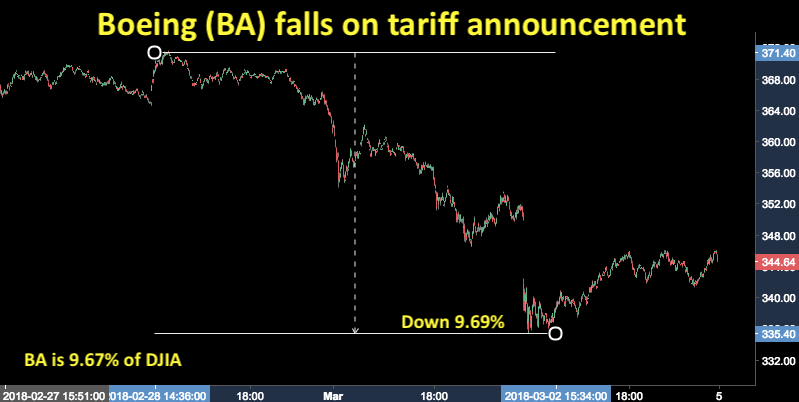 Boeing (BA) is 9.67% of the DJIA and fell sharply, a total of 9.69% by the low of the following day. The result was a decline in stocks across the board, with SPX and DJIA falling over 1%, the first time in two years that this has happened on three consecutive days. The ISM PMI beat at 1500 caused a brief but not insignificant (1%) rally in SPX, but this faded quickly as the tariff news spread. 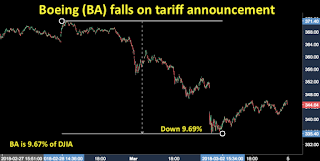 DAX, also troubled by four problems; the German coalition vote, the Italian election, a sharp rise in EUR, and the effect of tariff on its auto sector (14.55% by weight) fell by 2%, and FTSE and NKY followed the trend. The dollar rally ran out of steam on the protectionist news, and the day saw the greenback down against all currencies, even CAD, the largest supplier of US imported steel and aluminum. After initially touching a six-week high, DXY shed 0.47%, and Gold was up in line. Yields fell sharply on the news, dipping briefly below 2.8% for the first time in nearly a month. Oil continued to fall on the EIA (and earlier API) stock miss. The equity indices stabilised on Friday. After a further dip during the Asian and European sessions, SPX defensive and technology stocks led a recovery in the US session. 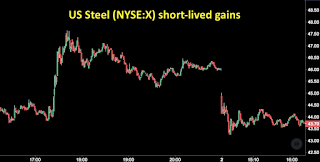 This resulted in a 1.1% gain for the day in NDX, 0.5% on SPX, but a 0.3% loss on DJIA. 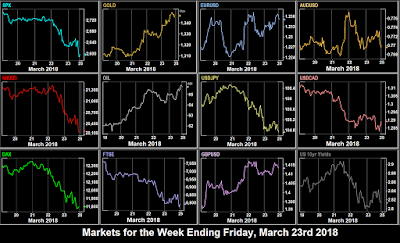 Similarly FTSE and NKY eked out tiny gains, but DAX, weighed with additional problems (and a further rally in EUR) closed down 2.3%, after touching a six-month (and within 9 points of an 11-month) intraday low. Oil followed a similar pattern, declining earlier to rally into the US close, finishing 0.7% up. 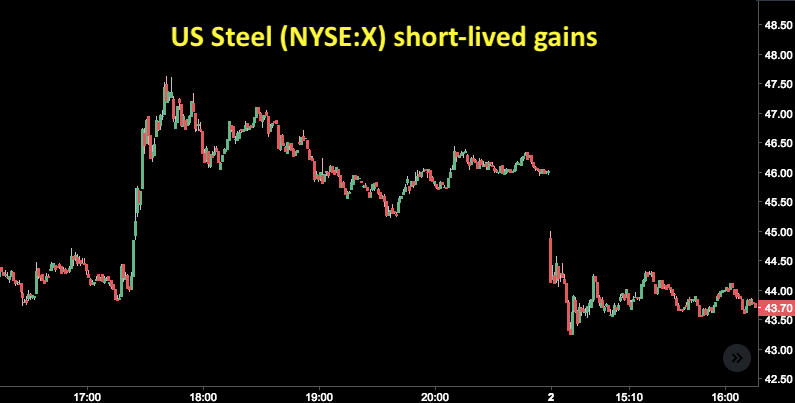 US Steel (X) gave up the previous day’s gains and gapped down at the open. 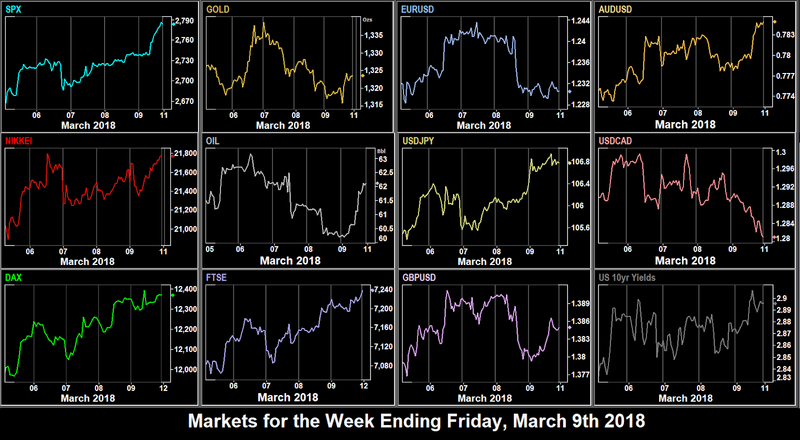 For once, the currency position was mixed, was traders absorbed the excitement of the week and the prospects for the weekend. 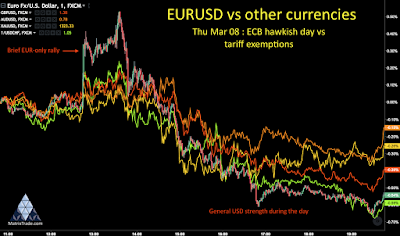 EUR rallied again, to complete a V-shaped pattern and close flat for the week. JPY also rallied on BoJ suggestions that it could tighten monetary policy as early as next year. GBP continued to recover from the sharp drop on Wednesday. However Canada’s miss on GDP at 1330 and tariff fears kept the loonie in the red. AUD was also slightly down despite Gold adding a nugatory 0.4%. Yields were back up 6bp, erasing Thursday’s losses but finished roughly flat on the week. 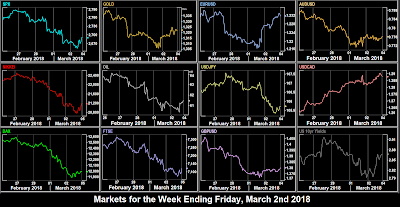 A mixed USD picture this week, with JPY sharply up, and CAD sharply down on the steel and aluminium tariffs. The forex trade of the week would certainly have been to sell CADJPY to make 3.11%. (The last time a pair moved 3% in week was Oct 20th last year). Volatility returned to indices after last week’s calm, with DJIA posting a lot of 100-150 point hourly candles. 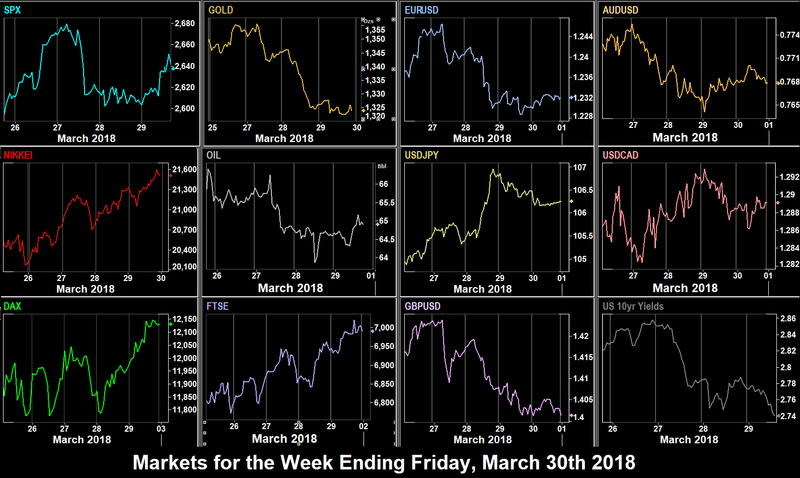 All indices fell all week, but the biggest mover, and best overall trade was DAX which gave up 4.34% on Italian election uncertainty. Gold has ignored most of this recent volatility and finished almost flat. Bitcoin had a good week, up 7.98% whereas Ethereum was much quieter, finishing almost flat. Since our cut-off, both currencies have rallied into the weekend. Next week will initially be dominated by Sunday events in Europe, the Italian election (first exit polls at 2200), and the formation of a continuity coalition in Germany following the SPD vote. With four major rate decisions and NFP, next week should see the volatility unabated. Monday sees the US International Trade Commission issue a decision on anti-dumping duty (tariff) on welded pipe imports. This affects Canada, China and India. Fed Quarles (voter, dovish) speaks at 18:15, but only on foreign bank regulation. The economic prints are all PMIs. All are well into growth (above 50), so only a large variation from estimate is likely to move markets. Australia is closed for Labor Day. Tuesday sees the first of four rate decisions this week, conveniently spaced at one per day. The RBA are expected to keep rates on hold. AUD is under pressure at the moment, but any move may come on Gov Lowe’s speech which is 18 hours later (the next day, locally). Staying in that part of the world, the monthly NZ Milk Auction is today, and historically does affect NZD noticeably. We have a fractal for that. Fed member Dudley (centrist, voter) speaks at 1230, and Fed Governor Brainard (über-dove, voter) is on at 7pm Eastern (0000 Wed). Remember this is NFP week, so Wednesday’s ADP ’sneak preview’ is always useful. Note that the new Canadian ADP report is not synchronised to be released two days before the official jobs report, so sadly we cannot plan a USDCAD position early. The estimate is 195k, close to the NFP estimate, so a large variation should have an effect. Also published at the same time are productivity and unit labor costs, part of the employment mix. Remember that four more rate hikes are said to be priced in, so a miss will have more effect than a beat. Today’s rate decision is from Canada. A hold is expected, but a rate hike is partially priced in for next month. CAD is of course under pressure because of the tariff announcements and NAFTA in general. Anything dovish could push CAD further down. Fed speakers today are Kaplan (dovish, non-voter) at 0130, Dudley and Bostic (both neutral voters) at 1300. Turkey, Poland and Malaysia also have rate decisions today. Thursday’s key event is the ECB rate decision. As usual, the rate will are announced 45 minutes before the conference, and it is the latter where volatility usually occurs. Traders will be looking for an update on the long-term projections for Eurozone inflation (HICP), but further statements on unwinding will also be listened for. The BoC Deputy Governor Tim Lane’s speech is important as the first one after the rate decision. Otherwise the Trans-Pacific Partnership (excluding the US of course) FTA is due to be signed. Markets are closed in Russia. The US NFP estimate is in line with previous months, but the Canada estimate at 68.5k is close to the record highs of December and January, and is equivalent to a US figure of 616k, population adjusted. If this beats, it must surely make an April rate hike a near certainty, and reverse CAD’s dismal record recently. There has also been talk about Canada being exempt from the new aluminum and steel tariffs as part of NAFTA, any firming up of this would also be a shot in the arm. Definitely one to watch. Also important in the Asian session is Chinese inflation. The Fed speaker roster is Rosengren (hawkish, non-voter) at 1740 and Evans (dovish, non-voter) at 1745. Finally as Oil seems to be responding to the API and EIA weekly stock reports, it is worth watching the response to the rig count.